In 2016 Ridgeford Developments Ltd (RDL) as Development Manager for Moxon Street Residential (MSR) secured planning consent from Westminster City Council for the development of the Moxon Street Car Park site (map of site at the bottom of this page), to provide new residential, retail and community space. You can view details of the planning application and consent here, and the proposals as presented at our public exhibition can be downloaded here. Ridgeford Developments are now known as Concord London, and have appointed contractors who are undertaking various preparatory investigations on and around the site. This website will provide you with details of the target construction programme and any upcoming activities which may be of interest to neighbours. Kier have been appointed as the main contractor for the works on site. Works began on site in December 2018, as detailed below. Kier have been appointed as the main contractor for the works on site, and commenced work in December 2018. All work on site is being carried out in accordance with Westminster City Council’s (WCC) Code of Construction Practice, details of which can be viewed here. The site is registered with the Considerate Constructors Scheme. There may be occasions where activities have to occur outside of these times. Should this be necessary, agreement will be sought from WCC and all neighbours will be appropriately advised. The construction activities will be carried out in accordance with a Site Environmental Management Plan (SEMP), which can be viewed here. The Construction Management Plan (CMP) for the scheme can be viewed here. The CMP document forms a part of the SEMP above. Excavation of slit trenches in the pavements and roads around the site to identify exact locations of utilities and services. 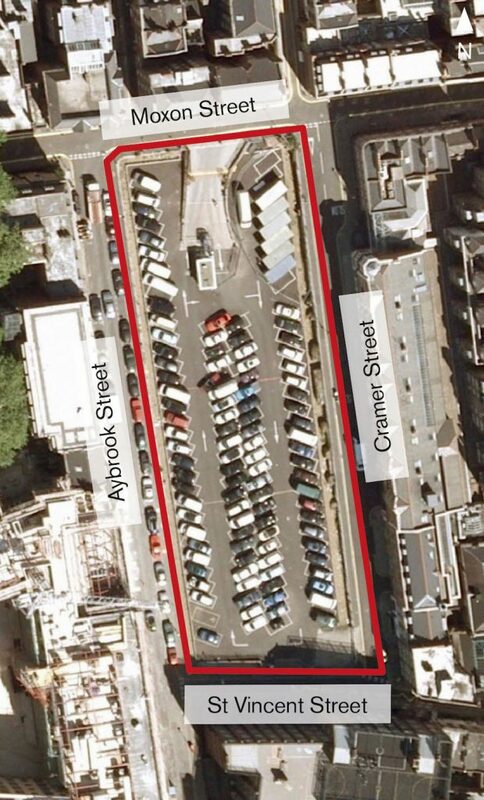 Closure of the car park to public vehicles at the end of October. Please note that the London Farmer’s Market will continue to operate every Sunday but will be located on Aybrook Street from this time. Surveys of the pavement vaults around the perimeter of the site these are the vaults associated with the terraced housing that used to occupy the site). Installation of a temporary hoarding around the site. Disconnection and removal of the street lighting adjacent to the site and its replacement with lighting on the temporary hoarding. Installation of welfare cabins on site. UK Power Networks (UKPN) had planned to disconnect the electricity to the site in December. However, they subsequently discovered that the power supply to the car park was also supplying power to nearby properties on St Vincent’s Street and to certain streetlights on Blandford Street at the junction of Aybrook Street. Consequently, the power supply could not be disconnected as planned. This is causing a delay to our works as the power cables are located in the pavement where we need to remove the pavement vaults. We have to wait for UKPN to separate the various supplies before we can make further progress. UKPN will, therefore, be undertaking isolated diversion works at the south end of Cramer Street and on Ayrbook Street adjacent to the junction with St. Vincent’s Street (See UKPN plan attached). The work on Cramer Street is planned to start during the school half-term on Monday 18th February, last for up to 8 working days, and will involve some digging up of the road. We are currently waiting to confirm the date for the works on Aybrook Street but will advise shortly. The water supply for the site is also being disconnected by Thames Water. This work will take place on St. Vincent’s Street between Aybrook and Cramer Streets and is scheduled to commence on Monday 18th February, will last 5 working days and will require the road to be dug up at this location. Thames Water has submitted applications for work permits to install a temporary water supply and to relocate a fire hydrant at the western end of Moxon Street. We will advise once dates for these works are confirmed. The video below by the contractor, Kier, shows the proposed consequence sequence. © 2017 Ridgeford Developments Ltd.